Greg and I returned recently from visiting the Lord’s Servants Home (LSH) in Kitale, Kenya. It has been some time since our last visit. Our goals on this trip were to assess the effectiveness of the management, condition of the home, school, and children, and to fortify communications and objectives for the education and future of the Children that MSM has sponsored over the years. We found everyone doing well and preparing to start Term III of this school year. I specifically enjoyed meeting with the older kids who have finished High School and was encouraged with their progress….many of them are in college courses like Kenny in Nursing School and some working jobs, including Brenda who is now a teacher at the school. Others are in the planning stages of taking steps toward their future education and profession. The Lord’s Ministries (TLM) is the Kenyan ministry that operates the LSH and school. Since our last visit, TLM has changed staff, assumed responsibility for operation funding, and has refocused on ministry objectives. This was all evident and positive. The partnership status with TLM involves that MSM provide for school fees and school supplies while TLM provide all other support and funding such as salaries, food, medical, and utilities. This trip was an unannounced visit and we verified that TLM has been acting in good faith to support the children in a healthy manner, operating the home and school as well as possible, and using the infrastructure in a responsible way. MSM will continue with this partnership arrangement which focuses on….. Assisting through funding the kids education in an accountable way. 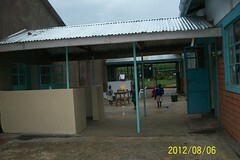 Trips to assist with the repair of the buildings and assets used to care for the children. Encourage and bless them in a Gospel way. We supported these objectives on this trip by paying school fees, shopping for school supplies the older kids need, buying new mattresses and bedding, and making plans for an infrastructure and spiritual support trip in 2019. Thank you for your support of MSM on behalf of these children. It has made a difference in their lives. Enjoy some current photos.